In a glass dish, mix together the olive oil, mustard, garlic, lemon juice, orange juice, basil and white wine. Add the prawns, and stir to coat. Cover, and let marinate for 1 hour. Light your Black Knight Barbecue grill. 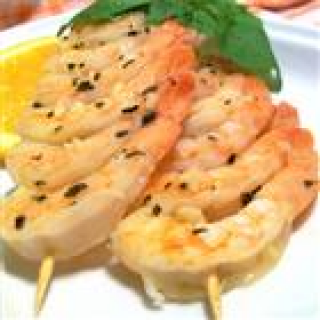 Thread prawns onto skewers. Grill for 3 to 5 minutes, turning once, until pink.